(JTA) — Ten Jewish-American baseball players will become dual Israeli citizens partly to help the country’s team make the 2020 Olympics. 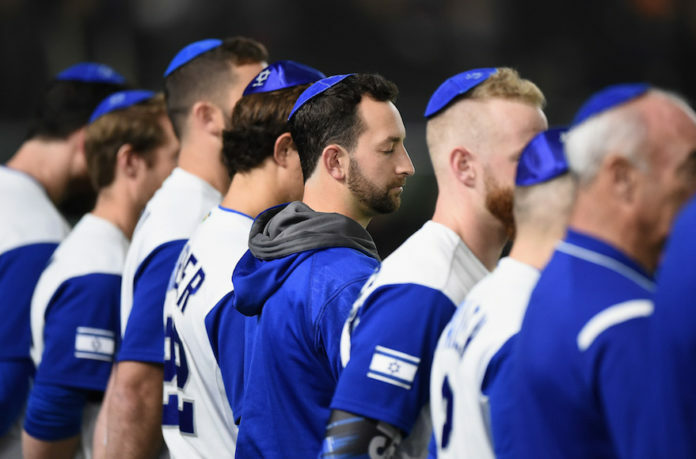 Some of the players, who will visit Israel’s Interior Ministry next week to begin the process, also represented Israel in last year’s World Baseball Classic, where Team Israel shocked followers by reaching the quarterfinals. Jewish Baseball News first reported the development on Wednesday. While players in the World Baseball Classic only have to be eligible to be a citizen of the team’s country, players have to be actual citizens of the country they represent in the Olympics. They also must be citizens of that country for a year before they can start officially playing in pre-Olympic competition, which begins with the European Championship B Pool in the summer of 2019. The 10 players slated to make aliyah next week include five who played for Team Israel in the WBC: Corey Baker, a retired minor leaguer; Gabe Cramer, a minor leaguer in the Kansas City Royals system; Blake Gailen and Joey Wagman, who play in the Independent League; and Alex Katz, a Baltimore Orioles minor leaguer team. The others are Eric Brodkowitz, a former college player; Jonathan de Marte, who plays in the Independent League; Jeremy Wolf, a retired minor league player; and Jon Moscot and Zack Weiss, Major League Baseball free agents. Eight of the 10 players are pitchers. Peter Kurz, president of the Israeli Association of Baseball, has been contacting American Jewish players to gauge their interest in becoming Israeli citizens. Moscot, who has several relatives living in Israel, including an uncle and cousins, visited Israel ahead of the WBC and was impressed with baseball there. Because of their ages, the baseball players will not have to serve in the Israeli army after making aliyah. Baseball will be featured at the 2020 Summer Olympics in Tokyo for the first time since the 2008 Summer Olympics. The tournament will consist of only six teams. The 10 players are scheduled to play with Israel Association of Baseball players in a game next week at the Baptist Village baseball field in Petach Tikvah.